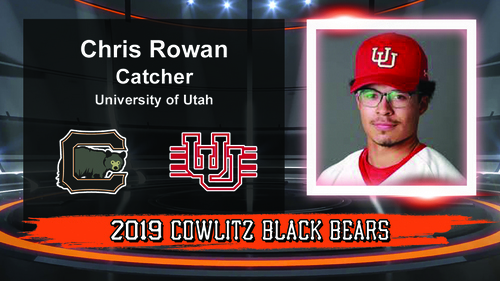 The Cowlitz Black Bears are happy to announce the signing of University of Utah junior Chris Rowan. A catcher for the Utes, Rowan started 32 of the 36 games he played for Utah last season as a sophomore. “Having his experience and maturity behind the plate will better our staff this season,” Coach Grady Tweit said. In the Pac-12, Chris hit .229, drove in 12 runs, and had seven extra base hits. Defensively, Rowan threw out 10 runners last season which tied him for seventh best in the Pac. A home-grown talent from Ogden, Utah, Rowan was a standout player at Cottonwood High School. He was an integral part of leading CHS to the 2017 5A Baseball Championship. “A good catcher is always the key to success in baseball, and we've got a talented one in Chris,” said General Manager Jim Appleby. Please join us and welcome Chris Rowan to your 2019 Black Bears!